Lean in really close so that I can whisper it. I'm allergic to math. No, really. A math allergy is a THING. It's bad enough that math gets ALL of the numbers. But then, somewhere around sixth grade it starts stealing the letters too. Bad form, Math. Stick to your side of the playground and let me stick to mine. When faced with math, I start to sweat. And not your dainty, little perspiration kind of sweat either. No. I'm talkin' REAL sweat; the kind that stains your clothes and makes you think twice about raising your arms above your waist lest you embarrass yourself and all your loved ones. And to be honest, it wasn't just the math-sweats that demanded a big math change. It was also my schedule and sanity. I had three kids deep into school and knew that I'd eventually add two more. A simple look at my schedule showed that I was over-scheduled. I could not teach one more thing. The previous year had proven that it is impossible to cram 56 hours worth of momma-work into a 24 hour period. Even I could see that THAT was a story problem that just wouldn't add up. I knew I needed to take something off my plate. And to be honest, I also knew that contrary to popular opinion, as a homeschool momma I didn't need to teach all.the.things. I just needed to figure out how and from whom my kids would each learn. It's been nearly four years since I purchased that first CD set of mathematical magic. Am I still happy with it, you ask? The lessons follow a spiral approach to learning. Spoiler alert: I'm NOT a fan of math mastery programs. Teaching Textbooks follows a spiral approach to learning. Each lesson contains the following components: a thorough introduction of the new concept, a short explanation of how it applies to the other previously learned concepts, a handful of practice problems that reinforce the new concept, and a large review section of old and new concepts. I'm just gonna repeat that statement while you take a moment of silence to let the glory of it sink in. THE LESSONS ARE SELF-GRADING. After each lesson, a "grade" screen pops up. It shows which problems were missed, which problems had to be repeated, and provides a final score. In addition, a grade book section keeps a record of all previously earned grades for both daily lessons and quizzes. This grade book is password protected and only accessible to the teacher. I can see at a glance how my kids are doing each day on their daily assignments and their overall semester. I have a personal house rule that should a child score lower than 90% on any assignment, he or she has to repeat that lesson before moving on to the next one. I want to make sure that each new concept is fully-grasped. Should a lesson need to be repeated, I can access the lesson on the teacher's grade book and delete the low grade which then erases all of the child's answers from the software and allows him/her to retake the lesson. The teaching portion of any lesson can be re-accessed at anytime. If my child just isn't grasping a concept or needs a refresher on one particular portion of the review section, he or she can go back to the teaching portion of any lesson with just the click of a button. The teaching is done with both audio narration and visual graphics and can be replayed or fast-forwarded whenever necessary. The lessons are applicable to real life. Honestly, who cares what time two trains traveling at two different speeds and coming from two different directions will eventually meet in the middle? I'm 37 years old and have never had to solve that equation in real life. Not ever. I'm guessing that unless you're a train conductor or have some weird Amtrak fetish, you haven't either. So why do math curriculums insist on filling worksheet after worksheet with ridiculous story problems like that...with scenarios that have absolutely no value in the real world? Teaching Textbooks, on the other hand, includes story problems that are actually relevant to life. Useable math, like that found in TT, helps cure the "why do I need to know this" disease that so many kids contract while sloughing through difficult math problems. The digital graphics are an attraction not a distraction. I'll admit that when I first ordered the program, I was a little nervous that the digital component would be an obnoxious complication. 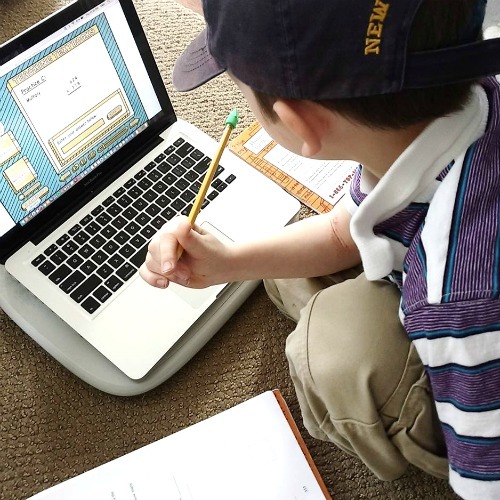 Many digital learning games and curriculums are so jam-packed with flashing lights, fast-paced animation, and irritating sound effects that they feel more like a video game than an educational tool. Since we're not really a video game family, I wasn't sure how well I would welcome a digitally distracting math curriculum into my home. I was pleasantly surprised to find that the animation, sound effects, and pace of Teaching Textbooks are very mild. They add interest to the lessons without be overstimulating. Since Teaching Textbooks, like all traditional curriculums, has a unique scope-and-sequence, it's important to take the placement test before purchasing a particular grade level. In fact, forget about grade levels altogether and order the package that best fits your child's current math needs. When I first ordered material for my fifth grade daughter, I ended up purchasing the Math 7 pack because the placement test indicated that I should. My sons have also each needed a higher math. So, definitely take the placement test and purchase a pack based on the test score, NOT on your child's grade level. Individual CDs are replaceable for a small fee. Should you lose, scratch, or break one CD of a six-disk set, you don't have to re-purchase the entire pack. You can buy one lone CD replacement. Pieces of each package can be purchased a la carte. When buying a particular grade level, you can bundle both the CD set, workbook, and answer key together for a slightly discounted rate. 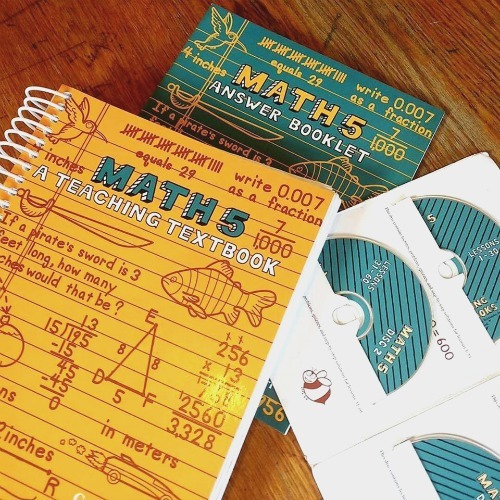 You can purchase the CD set as a stand-alone if you don't think your child will need to work the problems out on paper before entering his/her answers into the computer program. Or, if using the disks multiple years or for more than one child at a time, you can purchase the workbook and answer key separately without having to purchase a duplicate set of disks. The workbook contains not only the practice problems, but also a written version of the entire lesson. 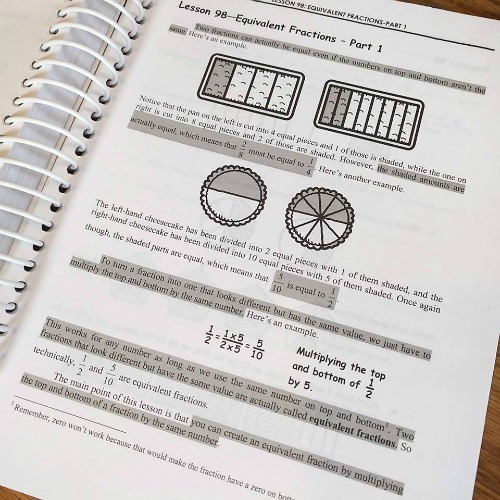 So, should you have a child who prefers not to use the audio/digital lessons at all, you can order just the workbook/answer key pack and use the program as a traditional math curriculum. My daughter has never wanted to use the workbook, but prefers to just use scratch paper to work out her problems before entering her answers into the computer. My sons, however, need the workbook. I've found that when they try to re-write the problem on scratch paper in order to solve it, they often miswrite or transpose numbers which in turn, always leads to incorrect answers. By having the problem already written down in the workbook, they can solve it correctly. It's not often a curriculum saunters into my life and steals my heart. 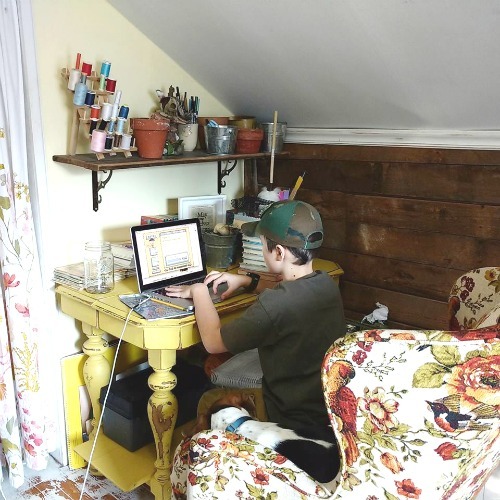 Teaching Textbooks has been homeschool perfection for this momma who has a very real aversion to all-things-math. Since starting the program, year after year my kids have scored above grade level on their mandatory state achievement tests. Not only do I have one less plate to spin each day, but I can now rest easy knowing that my retirement fund doesn't have to be depleted by the purchase of sizable amounts of deodorant. No more math-sweats for me! For more information about Teaching Textbooks, be sure to follow them on Facebook, Instagram, Pinterest, and Twitter. Yes, 56 watermelons! I hope you enjoy TT as much as we do. We use to have so many tears during math time...mine and the kids. But, now we don't. There will always be difficult concepts to learn, but the explanations given on the program seem to make them easier to grasp. I think I am sold on these math textbooks too! I am usually concerned when someone says I should do something so strongly. I understand there is good intention in it and I appreciate your honest opinion and the reasons why you like doing or using something (which can be really helpful to people when they are faced with similar situations and decisions to make) but it really is a matter of what works for each person or family. I am not sure I understand your intention in saying "and why you should too", however that is saying you know what I should do better than I do. I am not offended at that, I am concerned with it. I write this not with the intention to offend either. Best wishes. I never meant to strong arm anyone into buying ANY curriculum that does not fit their needs. If you're a regular reader of my blog, you'll recognize that THAT is very opposite of my entire blog message. The title, like the rest of the article, was written with hyperbole for the sake of getting your attention and adding a little humor to your day. That's it. I'm the biggest fan ever in the whole wide world of hyperbole. Use it with indiscretion, girlfriend!! Thank you for clarifying, I guess I am not a fan of hyperbole - and I now I know! Thanks, Krista. Since much of my life feels like one giant hyperbole, it just comes out naturally, I suppose. I have used Horizons and Saxon and liked them but when we got to upper level math I was lost with both of those curriculums. Horizons had no way to go back and look at the concepts taught and Saxon threw some curve balls in the problems that they did not explain in the lessons. I tried all the supplemental products with no luck. 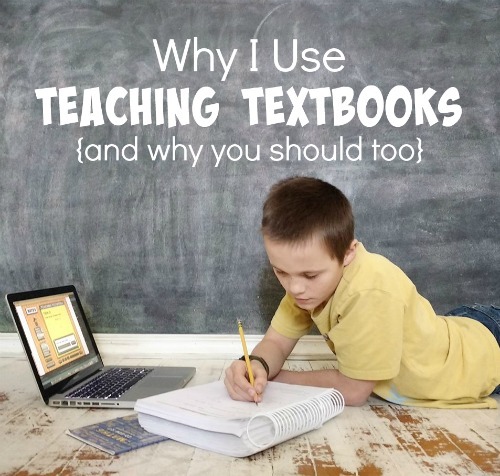 I found Teaching Textbooks and decided to plunk down the money in desperation because nothing else was working. My kids love it! My oldest was failing Geometry and Algebra 2 but when he started the TT Geometry it just clicked. This was so exciting to me. My daughter is flying through Algebra 1 and my other son is doing pre-algebra in 7th grade. This curriculum has been an answered prayer (literally). Yes! That sounds so similar to our story. I'm so very grateful to have found a Teaching Textbooks when I did. It has been a life saver. They have placement tests on the Teaching Textbooks website. They're free to download. Thanks sooooo much for this post! I took a look at the placement tests and believe my daughter will pass the 6th but notice that there are some things that she has not learned yet. How do they handle that? Thank you so much !!! I think TT does a great job of reviewing old material. So, if there's something she missed or hasn't quite mastered, she'll get plenty of practice at it.